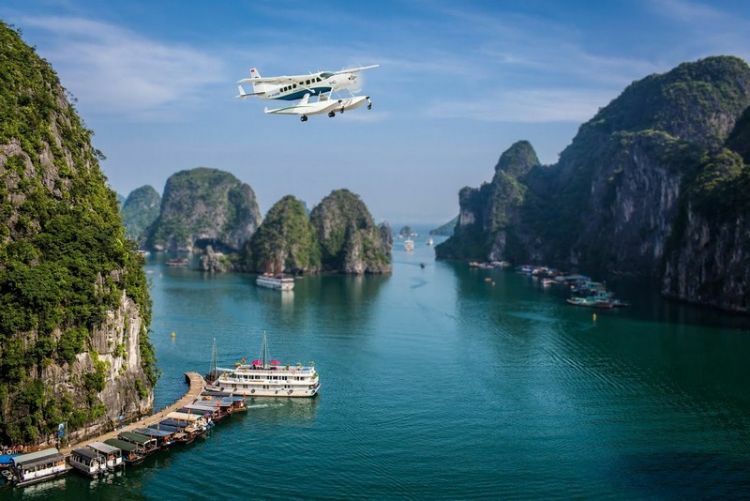 Discover the scenic landscapes of Ha Long Bay from an unexpected point of view: by seaplane. Take a romantic flight above the thousand of islands of the bay, from the sky you will appreciate the emerald waters of the gem of Vietnam. After a thrilling landing on water (a unique experience full of sensations), you will be welcomed on board of a private junk with cold towels and fresh juices. Once settled, the junk will leave the pier to take you for a stunning cruise in the middle of the islets. Following this morning of sensations and emotions, make yourself home and enjoy the sun deck while your personal chef is preparing some fresh from the ocean seafood for lunch. In the afternoon, you will enjoy the charming and welcoming personality of the bay’s inhabitant. Firstly, you will stop at a pearl farm village where you will discover the process from growing oysters to harvesting the pearls, explained by local experts. Then, your sense will be awake in a small floating market, you will be stunned by the variety of products and the bustle of merchants coming and going. Spend the night on board of your private junk, enjoy the quietness of a starry night and observe the procession of the small lights of fishing boats on the horizon. After a night being soothed by the waters of the bay, slowly wake up with the sunrise and meet your personal Tai Chi teacher on the deck of the junk. You will learn some basic movements of this ancestral martial art surrounded by a stunning landscape and feel the energy pass through your body. Enjoy a delightful and fresh breakfast prepared by your chef. Embark on a small bamboo sampan or on a kayak for the more adventurous and head to the mysterious Luon cave. With a high-biodiversity, unique colours and rocky cliffs, the Luon cave is a must in the bay. Keep your eyes open and your head up and you will maybe be able to caught sight of a small community of monkeys bouncing from a tree to another. Head back to your private junk, and appreciate your last moments in the stunning Halong bay. Once you disembark on the pier, you will be transferred to Noi Bai airport in Hanoi to take your flight home. Chartered cruise on Indochina Cruise with private Vietnamese chef preparing all meals on luxury junk. This sample excursion can be modified or upgraded according to your needs. For more information or to create your own personal itinerary contact us here.